I had devised an interesting way to provoke thought in a bumper sticker message (something I often attempt - sometimes with mixed results). The sticker read "If Your Honor Student doesn't know Marx from Madison, Thank the NEA!" A good friend of ours wanted more copies of this prototype and asked for permission to have some copies made which I happily granted. So she went to a copying and mail service - one of the popular franchises. A young girl politely waited on our friend and produced the copies as requested. But when she was ringing up the order her curiosity got the better of her and she just had to know more about the message of the bumper sticker. She just had to ask: "By the way, who is Marx from Madison?" I suppose she thought Marx was some guy from Madison Wisconsin? The girl's question may prove a useful Metaphor for modern education in America. She probably had some notion of what an honor student was. Maybe she even was an honor student. But, rather than dwell too much on one girl's perhaps justifiable ignorance we should gravely consider that the educational establishment in this country does not have a bona fide American agenda - that their true goals are more in line with Karl Marx than with James Madison - Father of the Constitution of the United States. More importantly perhaps, we should consider that most Americans probably could not distinguish between the philosophies of Marx and Madison. Chances are, if you don't believe it, you're probably one of them. Sadly, that might also mean our fellow citizens do not know the difference between the way to national extinction and the way to national salvation. I have grown fond of Noah Webster, Founding Father of American Education. You will no doubt be able to greatly expand your comprehension of the word "honor" if you should happen to own or have access to a copy of Noah Webster's Original American Dictionary of the English Language, 1828. In the definition for "honor" at number 6, Noah defines honor "True nobleness of mind; magnanimity; dignified respect for character, springing from probity, principle or moral rectitude; a distinguishing trait in the character of good men ['magnanimity' is now somewhat archaic as is it's synonym 'altruism,' This could have been predicted since neither is really part of the modern American academic agenda. 'Probity' is an archaic word for absolute honesty. Webster described it also as "strict conformity of actions to the laws of justice." One should note that Webster's notion of justice is transcendent. He would be speaking of justice in terms of alignment with the will and nature of God]. Do you get the impression that there may be reasons other than "evolution" to explain why many words are now "archaic?" Are absolutes "archaic?" It becomes rather obvious that, to the founding generation, "honor" had much more to do with moral, ethical and spiritual values than with either high marks in academics, or performance rated more along the lines of compliance than creativity. It certainly could have had nothing to do with yielding to peer pressure or to docile compliance with an Outcome-Based Education regime in order to curry a few kudos. Conformity is not honor. Measuring students only against other students instead of timeless absolute truths is also not honor. It really doesn't matter which students from which country you are using as a measuring stick, you are still using a guide that allows for declining expectations as well as performance. If man was created for higher goals by a "Higher Authority" he should be looking to his Maker for the proper measuring standards. Even Forrest Gump seemed to grasp that. What is wrong with the current educational establishment? Does it drive you crazy when you see one of those "Proud Parent of an Honor Student" bumper stickers that are now almost more ubiquitous than bumpers? It certainly bothers me. I don't believe there is really that much honor being passed on to the next generation. If it is, I am fairly certain that it is not being passed on by government-controlled schools. I can say with great certainty that real honor was not in the curriculum in the public school where I once taught. I can't remember hearing many honorable discussions in the teacher's lounge. However, I do remember the not-so-subtle pressure to get every teacher participating in automatic payroll contributions to the NEA. Those who teach docile compliance must be submissive I suppose. If there are that many "Honor Students" I think to myself, there should be a concurrent overflowing of "honor" into our society. There must be a whole lot of honor out there somewhere, right? Otherwise, what are all these bumper stickers heralding? What results can we expect from a brand of "honor" that is the certified goal of "free" public education in what still [for those who are as bad at math as most government and media agencies] is the later part of the 20th Century in America? I think the "honor" being promoted is no more genuine in nature than the "charity" that will result from institutionalized compulsory community service. Imagine that, the schools are promoting compulsory community service as part of the curriculum while the courts are handing out the same thing as an alternative punishment. Will any of our "Honor Students" connect the dots? Are they not bright enough to realize no true "charity" could ever be compulsory, and that when you make charity compulsory you pervert it into an act of worship for the State? "Free" public education, even though it is a Plank of the Communist Manifesto, has become something of a religion for those who believe in it. However, there are remarkable differences between truly free public education and government-controlled education. The more subtle the government control in the beginning, the easier it is for them to gain a foothold. The Bolsheviks meant government-controlled education when they said "free" public education and their philosophical heirs in the NEA mean the same thing. The public school classroom is getting more and more politically correct every day. This political correctness not only attempts to force a secular humanist world view down the throats of every child, but, for the most part, it also places a valid comprehension of original American political philosophy out of the reach of the most "honorable" among them. Incidentally, if one should hazard to attempt the comprehension of The Federalist Papers, he should be humbled enough by that experience to return his honorary degrees as he realizes those documents were commonly understood and intelligently discussed by the farmers of that day. (a) The Declaration of Independence. (b) The United States Constitution, including the Bill of Rights. (c) Substantive selections from the Federalist Papers. (f) George Washington's Farewell Address. This goal is an axiomatic impossibility since almost none of the students, or, for that matter, their teachers, have the "enzymes" necessary to digest the Federalist Papers. 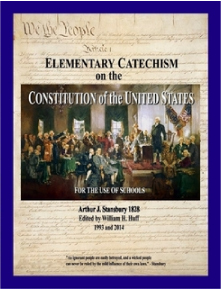 While many students do not read at grade level, few who reach the Masters Degree level ever achieve to the reading level typical of the writings of the Federalist authors. How, indeed, will teachers in a State where some have been contemplating the implementation of Ebonics be capable of making a distinction as to the more "substantial" aspects of certain of the Federalist Papers? Is the California goal unrealistic? Yes, under present circumstances. Should it be abandoned? No! Not under any circumstances, primarily because it indicates something of the level on which we all should be reading and writing if we want to be self-governing and free. It is no longer a question of "being" free, but one of once again becoming as free as the Framers envisioned. This will never happen while we don't even know what liberty with responsibility really means. Let's all get to know Marx from Madison! We cannot afford to ignore the Federalist Papers simply because they are above our present comprehension level. If the Federalist writers, as astute as they were, thought their information was crucial, where in the world would we look for better solutions to the problems they addressed? If you have something better let me know - we will post it at lexrex.com. Repeat after me, "We must all the learn the Federalist Papers together. Then we will begin to regain the knowledge required to return to self government." While you are at it have a crack at the other materials on a list compiled by Jefferson and Madison. These include The Declaration of Independence, Washington's Farewell Address, The Virginia Resolutions of 1799, Essay Concerning the True and Original Intent of Civil Government by John Locke, and Discourses Concerning Civil Government by Algernon Sydney. If you want to know Karl or Jim, read their words. For Marx, it would be a good start to read the Communist Manifesto - especially the Ten Planks which bear an uncanny resemblance to our present situation of de facto government in the States of the Union. Also read The Constitutional Debates as they were carefully recorded by Madison and the Federalist Papers selections that were written by him. Then you will have a good idea of how many differences Mr. Madison would have with Herr Marx if they had ever met face to face. 6. Centralization of the means of communication and transport in he hands of the state. By the way, the de facto situation does not change merely because we create new labels. Dr. Thomas Sowell will be glad to get you up to speed on that. If we change for instance, the "Equal obligation to work," to "Equal opportunity to work," don't be so sure we haven't, in the final analysis, merely played a little game with words. If controlled dynamics force you to work; or force both husband and wife to work, the "Equal Opportunity to Work" may only comfort us because we are duping ourselves. Read the Ten Planks above and draw your own conclusions about whether they represent life in the United States to one degree or another. Use your imagination. Are there encroachments on property, liberty and free choice in our country today? Do we have less government regulation and bureaucracy than Madison had in his day? If we are more regulated today, would you say the increase is more along the line of a Marxist or a Jeffersonian/Madisonian model? If, as The Founding Fathers all agreed, the only lawful function of government is the protection of life and property, would you agree that the assaults on property and liberty by a Marxist model are antithetical to everything the nation was founded upon? Some say it's not what you know, but who you know. Others say a good lawyer knows the law and a great lawyer knows the judge. I say it pays to know Marx from Madison. The dividends of truly critical thinking that enable us to clearly distinguish between these two plans for human government and economy could mean the difference between life and death, between an America where liberty thrives and one where it is only a trite and misty memory distorted further by "anointed" historians who have been converted into the Party Priesthood. Who knows? Someday it could be a slogan: Marx from Madison, now he was a great American if there ever was one! Homeschool your own children, your grandchildren, or, of course, yourself, if you are of school age. As far as I am concerned, everyone is of homeschooling age and there will be no excuses either written or otherwise. Every other option is a "settle for" once you really know the truth about homeschooling. If you need help getting started visit the following links. We will post more as we continue to develop homeschooling resources but these are excellent. Remember, no excuses, and there will be a test!